Roberto Matta Echaurren, known as Matta (1912-2002) was born in Chile, and worked with Le Corbusier as an architect. In 1935, he joined the Surrealists in Paris. He spent the war in the United States, where he was influenced by Tanguy and Duchamp, returning in 1948 to paint a huge fresco for the Unesco building in Paris. Turning from mystical introspection to denounce violence and the worship of machines, he began to paint an alarming world of half-robots, half-puppets. 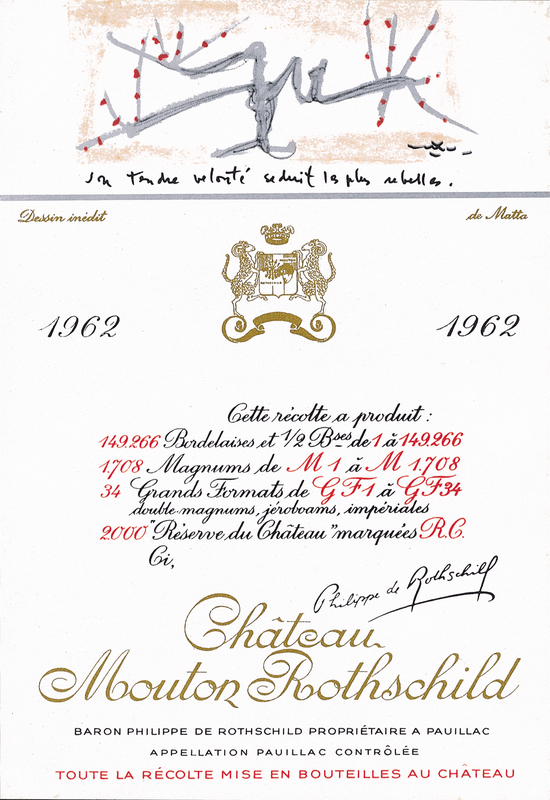 The tormented vine-root he drew for the 1962 Mouton Rothschild label still lets us imagine the promise of fruit to come. Witness the caption chosen by the painter: “Son tendre velouté séduit les plus rebelles” (Its velvet tenderness will melt the hardest heart).